Shawn you were awesome in your determination to get the car running. Chris you had what it takes to get the mission accomplished. All of you made a kid smile that will always be imprinted in my memory, along with many others. I swear when the car was being unveiled god made the sun the shine on a very special kid. We celebrate Turkey days usally in late July. This has been a strange fall, we normally are cold with snow. Thanks, that car wasn't going to get pushed, run poor, or sound, poor under my watch, or without the help of an awesome team. Kinda ironic how the sun popped out right when the car came out & lifted the REAL fog eh ? Who is this BTW ? I started a thread about this, I PM'd Cliff to change my title of my post. Sorry I wasn't clear--the problem was on my end. 21.6 kbps connection= no to streaming audio/video. I could see 'web shots' updated every couple of minutes, and tho I didn't know who it was, I knew someone was in the rear storage, bent over the engine for hrs and hrs. I stayed in chat and watched it all night and morning tho. Kudus to ya!! That is awesome guys! I really wish I coulda made it this weekend but as some of you may know, we were in the hospital all weekend having a baby so we were a little busy. Glad all turned out well! I can say I'm very proud of the Fiero community as a whole this is amazing. You mean you can post you had a little baby, and NOT tell us it was a Boy or a Girl? How about a name and we can guess? Lol it was a little girl named Bella Rose Coan. I will also be getting some photos tomorrow that you guys may like to see. I need to ask permission first. I can't say anything about the article, as it is not published yet... But you will all love it. 2.5 sent me two hi-res pics for me to host. So just right click the link and save target as. First picture is the group pic of people with Tyler's car. 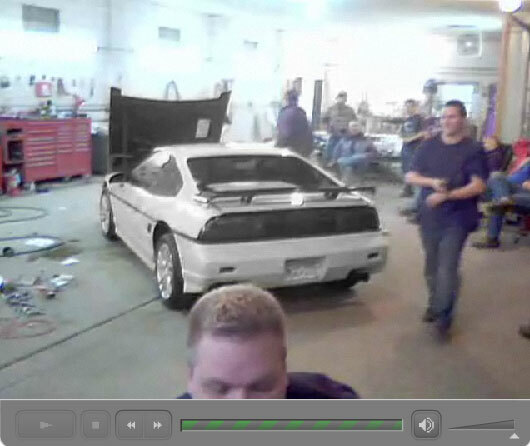 Second pic is of the Fiero's that showed up. Synthesis. Can you send it to me? Nope. Not until it publishes.. I promised I would not. "It isn't about the car. It is about the people. The car is just a common interest that allowed us to do this." PURPLE: So once you heal up from the trunk of this yellow GT, it will be time for another!! Great job Gentlemen, and Tyler, my family we be praying for you!! Self Installed Intercooled SC3800 II/III w/getrag. 19's with 13" Brakes on all 4 corners. 4 years in Avionics & 14 years in Car Electronics Experience. Thank you for taking the time to type all that out!! No audio and very very jumpy video on my end left me with a lot of unanswered questions about what was actually happening in that engine compartment. Exactly. Thank you for describing some of the events so clearly. Oh yeah. If someone has a EXTRA hat they could send me that would be awesome. On the way to the airport andersons bus officially became a part of the build. Soooo I gave them my hat. I will cover shipping. If not no problem. This video is unique... for the reason that not only is Tyler getting to take his little brother for a drive in his car, but Hulki is seeing this at the same time it happens. This is one moment I had the laptop in my left hand and my own camera recording in my right hand. The voices are myself standing in Frazee Minnesota... and Hulki (Andy) over laptop speakers while serving his country in Iraq. This vid has become very close to my heart, the moment it captures means alot. I love it Jason, I'm saving it to my hard drive. Does anyone else have a Tyler folder on their computer with millions of pictures yet like I do? Again, thank you for taking me feel like I wasn't in Iraq for a few moments. For a little while, I felt like I was in Frazee, and part of the celebration. ...... That didn't work either. Got home at 2:00 a.m. With only $25 & 21* temps i bundled up in the early a.m. on a GSX-R 1000 & headed for Frazee. 2.5 hours later i arrive.....frozen, at 10:00 a.m.
21o temps and flying down the highway two and a half hours on a bike, . I can only imagine the looks you got. "Look at that crazy fool", . If you had done nothing else, that right there would have kept me in awe. Heck, I think that is more amazing than the magic you did with the Fiero. I love this idea of an annual event. ***Maryjane if you are on dialup I suppose you can't see the videos either? If you PM me your address I can send a DVD disk with all I have to you. I agree with purple reign. There were no words to describe how sore I was. It was all worth it. I asked Tyler if he had ever gone to a MFF fiero show. He said no. Later I made the comment, "well since you were not able to make it to a show, we are bringing the show to you." I know Tyler would LOVE to have a show in his honor. I wouldn't hesitate one second. I would be up there for the annual Frazee Fiero Festival. Now only if my brother could fix the problems with his fiero lol. but is it possible to buy some Tyler Project shirts? My grandson's name is Tyler also and I would really like to get him and I a shirt! B) build up some additional funding for Tyler and his family. My apologies if this ha already been brought up and discussed. Just a suggestion, but if someone were to make a DVD of the videos and pictures taken during the build... I would be interested in buying one. WOW! That was the coolest build with so many people taking part in making Tyler’s dream come true I applaud all of you! I wish i could have made the trip to lend a hand but it looks like you had it covered...and then some. I would have probably just broken more stuff! It's amazing what you people did and ....i don't know what to say other than.... awsome. Yeah it would be excellent to have everyone send to a common location online or whatever is needed and have a huge compilation. All I have is the vids I posted here, and maybe 5 more shorter less "great" ones. Also a bunch of pictures. **Twofatguys is your collection pics only? At the very least Tyler should get an all encompassing video compilation. Hi Shawn. Glad to see you were there. Wish I could have flown in for the event. looking thru what I missed. LOL The fog machine was a nice touch! I showed this video http://www.youtube.com/watch?v=liKt1C7tEJg to my four year old and she said nice car Dad but it smokes more than your's does it was funny! I saw that it made the news that was great! Nice re-cap. You did forget one event, but I forgive you because we were all kind of punchy due to the hour of the morning. Tyler... thank you for asking for help. Just don't park it next to that huge turkey... he looked a little shifty. Tyler! Awesome that they want to display your car! I will be up again in 2-3 weeks to resolve the few minor issues we are having with the door locks and the remote start, and I will try to get the headlight motor issue figured out.. The motors reach full bottom, and won't shut off entirely, which is draining the battery. This is a common issue when the switches inside are out of adjustment. I'll get you taken care of. Also, your car will be headed to Tires Plus tomorrow to get the new Brake Master Cylinder. I felt the brakes in your car, and while the new Grand Am brakes stop it on a dime, the pedal travels too far... I am going to get the upgraded master cylinder installed for you, and that should take care of the problem entirely. Welcome to owning a fiero! I hope that car brings you some fun times! Tyler, you are most certainly welcome. Seeing your smile and the pride in your eyes at the reveal is worth a million thanks. Your Fiero is definately something to be proud of. Before we left Fred pulled the motors out and fixed them before we left Frazee. Also I'm having a new steering wheel ordered for Tylers car! It's bugging me so bad that I didn't get a wheel for it. The interior turned out so great and that wheel looked to bad. in my option.